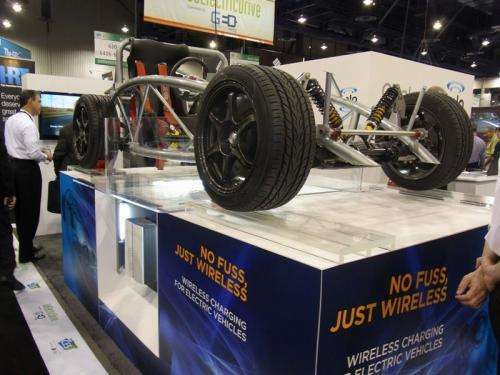 (PhysOrg.com) -- Qualcomm has demonstrated its new wireless power transmission system for electric vehicles (EVs) at the Consumer Electronics Show (CES). 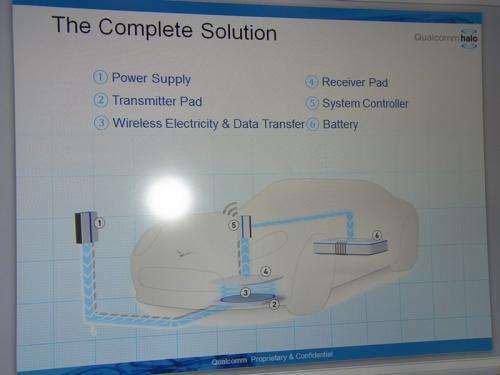 The system, including one pad for power transmitting, another for power-receiving, and control unit, uses the inductive transfer method to charge an EV. The chip-makers technology, Inductive Power Transfer (IPT), has a technology history that rests with the company that it acquired in November, HaloIPT. The latter, which made a name for itself in developing wireless charging technology for EVs, was a spinoff from the University of Auckland in New Zealand. 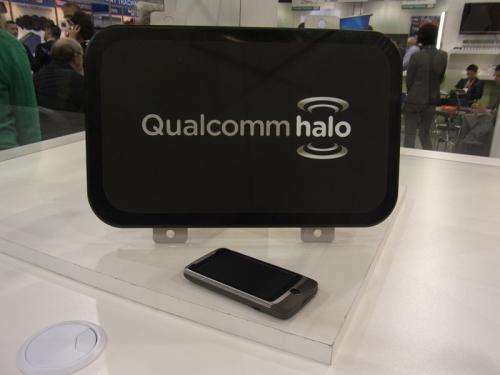 The Qualcomm Halo Wireless Electric Vehicle Charging (WEVC) technology demonstrated at CES works with a transmitter pad placed near the cars vehicle pad, which is connected to the cars battery. Once the car is parked over that pad, the car starts charging. A controller turns alternating current into direct current. An in-car display tells when the car is lined up and when charging has started. The system uses magnetic resonance to couple power from the Base Charging Unit (BCU) to the Vehicle Charging Unit (VCU). The system works on the principle of a magnetic resistance similar to charging an electric toothbrush, said Qualcomm's Joe Barret, a Qualcomm executive. According to Tech-On, the frequency range used for power transmission is 20k-140kHz. The power to be transmitted is 3kW for single phase, 7kW for three phases and 18kW or higher in the case of rapid charging. A home could be set up with the single phase 3kW IPT for charging a car overnight. Many product debuts at CES are regularly criticized by viewers as disappearing into vapor once the show draws to a close, but Qualcomms system is scheduled for a more aggressive debut, in the form of a field test in 50 EVs over a two-year trial period. Wireless recharging points will be rolled out across London this year to put the charging system to the test. The testing is supported by Transport for London and Mayor Boris Johnson. The Mayor has showed strong support in promoting EVs. In 2009 he pledged that every Londoner will be no more than one mile from an electric car charge point by 2015. Observers generally say that eventually all cars will use some form of electric engine and that means recharging. The more charging opportunity, the more confident customers will be about EV adoptions. While Qualcomm is throwing its competitive hat into the ring with its new charging system, the company does not deny that this is no magic bullet if there is no adequate transport system to accommodate wide deployment. Wireless recharging points embedded in roads to give electric vehicles complete autonomy would be the next phase, allowing drivers to drive and charge at the same time. Qualcomm says pads buried in the motorway can allow EVs to travel longer distances, have smaller batteries, and weigh less. More information: All images courtesy TechOn. How lossy is this transmission? It's London. Seeing how slow the traffic is, they could be placed anywhere. I foresee complaints about the noise. I foresee leukemia with hundreds of watts of of power radiating out of this thing even at the lowest setting, since it can't be 100% coupled anyhow. Just don't go in the garage with your credit cards.